Wayne Dobie (Robert De Niro) is a shy cop whose low-key demeanor has earned him the affectionate nickname "Mad Dog." 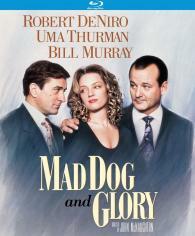 After Mad Dog saves the life of Frank Milo (Bill Murray), a crime boss and aspiring stand-up comedian, he's offered the company of an attractive young waitress named Glory (Uma Thurman) for a week. At first both are uneasy about the arrangement, but they eventually fall in love. However, the situation becomes complicated when Milo demands Glory back.